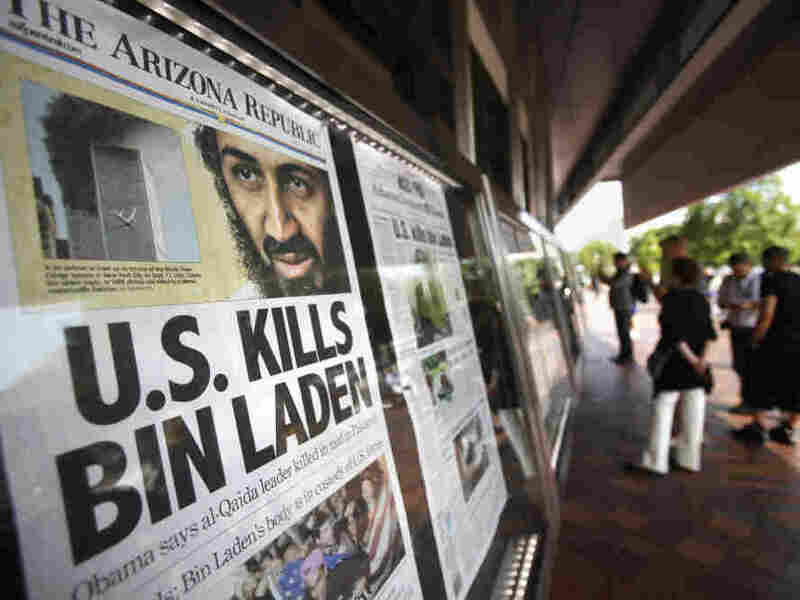 On Social Media, Americans React To Osama Bin Laden's Death On Twitter, Facebook, YouTube and news blogs, reactions are evolving at seemingly the same rate that these digital outlets are pushing out news of the U.S. military operation that finally took out the al-Qaida leader. People look at a display of newspaper front pages at the Newseum in Washington on Monday. Millions of Americans received the historic news not from Obama's televised news briefing Sunday night, but by text message, email and alerts from Twitter and Facebook, in many instances before the details had been reported by traditional media. If you want to know what Americans think of Osama bin Laden's death, don't bother turning on a television. Instead, check out Twitter, Facebook, YouTube or a news blog. There you will see that reactions are evolving at seemingly the same rate that these digital outlets are pushing out news of the U.S. military operation that finally took out the al-Qaida leader. More than anything else, the first reaction seemed to be shock, then celebration and then temperance. For instance, the first post on NPR's Facebook page, by Candace Hill on Sunday night, was simply "omg." The next, by Stephen Somogyi: " 'bout time." As more news was reported, people expanded their opinions. In response to celebrations in the streets of New York City and Washington, D.C., on Sunday night, Ryan Rooney on Monday cited a quote that he attributed to Martin Luther King Jr.: "I will not rejoice in the death of one, not even an enemy. Hate cannot drive out hate; only love can do that." NPR could find no record of King having written or made such a statement. Overall, the range of responses has been overwhelmingly positive, even among people who disagree politically with President Obama and his approach to combating terrorism. Perhaps just as notable is that millions of Americans received the historic news not from Obama's televised news briefing Sunday night, but by text message, email and alerts from Twitter and Facebook, in many instances before the details had been reported by the cable television networks. In the 20 or so hours since, social media have driven America's discourse about bin Laden's death, reinforcing the emergence of digital outlets as preferred sources of news for a rapidly increasing number of people. Twitter users are being credited with breaking the news, thanks in part to a man in Abbottabad, Pakistan, who tweeted the details of the U.S. raid on bin Laden's compound as they unfolded near his home (he was prompted by the sound of helicopters and gunfire but hadn't known the reason for the commotion). Within moments, the man gained 14,000 followers. Twitter says bin Laden's death generated the highest sustained rate of tweets ever. From 10:45 p.m. Sunday to 2:20 a.m. Monday, users pecked out an average of 3,000 tweets per second, according to Twitter. The traffic peaked at 11 p.m. Sunday, minutes before the president's televised briefing, with 5,106 tweets per second. Within hours, bin Laden's death was the subject of more than 2.2 million mentions on Twitter and nearly 40,000 blog posts, according to Sysomos, a firm that analyzes social media. By Monday afternoon, there were 2.8 million tweets and nearly 74,000 blog mentions. And Google Trends ranked "osama bin laden dead" as its most popular search in the U.S. on Monday. "This was one of the fastest-spreading and picked-up stories that I have seen in a very long time," said Sheldon Levine of Sysomos. "It compares with Michael Jackson's death. I think it may have exceeded the royal wedding from last Friday." In Washington, the thousands of revelers who gathered outside the White House were long gone by Monday morning and had been replaced by tourists. Jim Long of Riverside, Calif., hopped off his rented bicycle and posed for a photograph of him standing outside the gates of the White House. He smiled broadly as he held up a copy of the Washington Post's front page, with the headline: "Justice Has Been Done." Long, 57, said he tagged along to Washington with his wife, who came on business. He said he didn't get the news until he woke up Monday morning and turned on the television in his hotel room. "I bet that's what that noise was in our hotel Sunday night," he said. "I thought they were just partying. My wife couldn't sleep. "That was a good wake-up call. I didn't need my coffee. It's about time. But I never really lost confidence in our country's ability to defend itself." Others immediately began to calculate political ramifications and wonder if the successful mission would deliver a boost for the president, who recently launched his re-election campaign and has been criticized by Republicans as being weak on national security. "I'm glad it was him who found him," Charlotte Harris, who was visiting Washington from Tulsa, Okla., said of Obama. "They give him so much negativity." Standing beside Harris, her sister-in-law, Teresa Tolbert, said she was especially proud as a military veteran who served in the first Iraq war. "I didn't think they would ever get him. But our boys got it done," Tolbert said. She then turned to her 13-year-old son, Randy, and asked, "Don't you feel a little safer?" "Not really," Randy said, parting a shy smile. "I think America's got good protection. I'm just glad they got him finally." While his mother and aunt learned of the news from television Sunday night, Randy got word from a text message sent by his friend back home. Across the social media sites, Obama supporters used the news to urge critics of the president to revisit their opinions of him. Indeed, to a limited degree, some did. Outside the Washington Monument, Alison Hopkins of Orlando, Fla., said she wouldn't have known but for a Facebook alert from a friend who had known she was visiting Washington. Since then, she said, "I've been checking people's Facebook status all day." Her initial reaction? Shock, and not just because the U.S. finally completed its mission. "I was shocked that Obama carried through on it," she said. Hopkins is a Republican and said she had doubted Obama's commitment to fighting terrorism. "I feel bad if that was his stated intention all along," she said. "I don't know if it really changed my view of the president, but I'm impressed that he followed through. I was very proud of my country."